Create a new folder called plt in any convenient place on your disk. Add this new folder to your Matlab path. Extract the downloaded archive file (plt.zip) into this new folder. It is important that your unzipper preserves the directory structure. (Most unzippers will do this properly by default.) After the unzip operation the new folder will contain the files and folders shown below. Auxiliary function: called from figpos to determine screen layout (size, taskbar, etc). 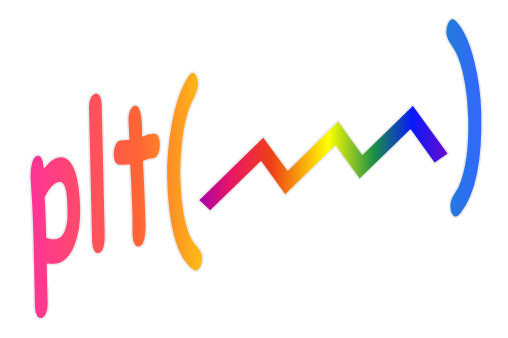 Color specification file: Rename this file to pltColor.mat to use Matlab's default colors. A complete description of the prin function. A folder containing all lower level html files and images. Alternative versions of some of the example programs listed above. Note that demoplt.m and the 31 example programs that it runs appear in a subfolder called demo. It's usually convenient to also add this demo directory to your Matlab path. If you prefer not to do that, you can still run the demo programs by using the Matlab cd command to make the demo folder active. You may delete the downloaded plt.zip if you prefer. If you type plt help or if you click on the "Help" tag in the plt menu box, then plt.chm is opened with the Windows help system hh.exe. (which usually resides in the C:\Windows folder) If hh.exe is missing or if you prefer not to use the chm compiled help file, just delete the chm file and plt will instead open plt.htm using your browser. If you type plt help or if you click on the "Help" tag in the plt menu box, then plt.htm is opened in your browser. This file points to many other html files and images inside the pltfiles\ folder. If your browser supports chm help files and you prefer to use it, you can do that by deleting or renaming the plt.htm file.